Harold writes about PKM continuously in his blog, and has also helped thousands of people worldwide use this framework in his very popular online workshops, which he runs privately for organisations or publically. I have talked and written a lot about the use of social media for professional learning, and in particular how social tools have transformed the way I work and learn. I was recently asked how my own use of social media fits onto Harold’s PKM framework. So I came up with this diagram which shows my own daily PKM routine. Although I search for (ie seek) stuff regularly during the day on Google, most of what I find out comes from the continuous flow of information from my professional network. Although for me, Twitter is my most important social network, there are many other places which drip feed me with content – and my network of people is constantly evolving as I discover new people who provide me with useful ideas, thinking and resources. I then synthesise any new valuable pieces of information with what I already know, asking myself does this add something key to what I already know, does this take my own thinking forward, or does this even change my thinking about what I already know. I then decide whether I should share what I have found with others (is it appropriate, of interest, relevant, etc to them? ), who I should share it with (internal/external networks? ), how I might best share it (in its original format (eg tweet)?, how I can add value to it or whether I should present it in some other way, e.g. write a blog post providing more detail of its significance.) I might even decide to share it in a number of different places and formats, of course. This PKM routine has now become an integral and essential part of my daily workflow; it is just second nature to me. If I have less time to do it one day, I will apply a different set of filters to ensure the good stuff still gets through to me, and I may not be able to share it immediately but save it some place for later. Harold and I both believe that PKM is going to become a key skill for the future. 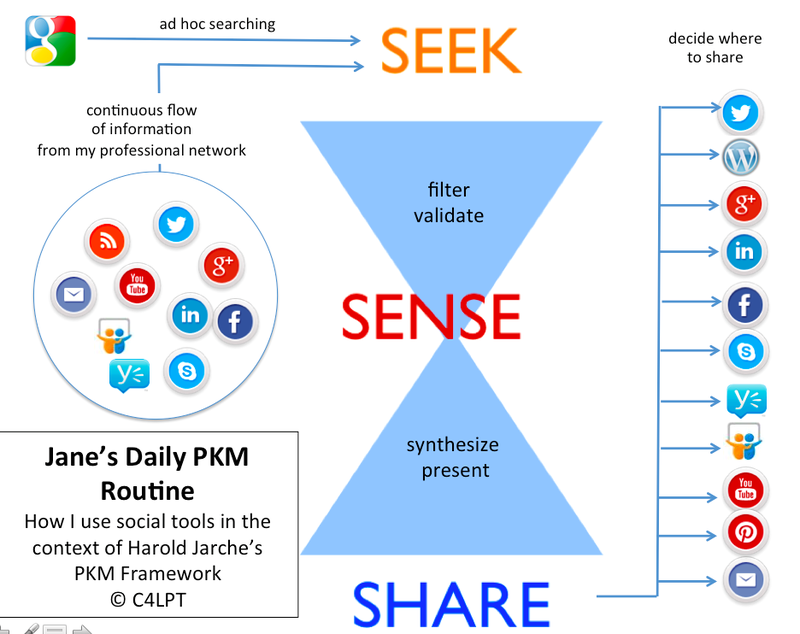 How do you use social tools in the context of the Seek-Sense-Share PKM framework as part of your daily PKM routine? I have been using this model ever since I began curating in various ways in various places. Now I am ready to take it to my students in a research writing class. Thanks for helping me crystallize this. I am beginning to believe that helping students develop a PKM is a process that is the other side of the coin of the product–writing. They must be taught together and they must reinforce each other. Terry, thanks for your comment. I agree that PKM is going to become an essential skill for student – especially in the new world of work. That’s why Harold and I are setting up A Life of Jobs – http://www.alifeofjobs.com – to help students (and institutions) build the new skills for the future. Jane, how much time do you spend on your PKM daily? You’re the best informed person I know in our field. Jay. It depends. Some days it just happens of all day – as I am consciously aware of the flow of information I am receiving – and responding to. Other days, if I am busy, it might only be half and hour to an hour. But this is now part of who I am; it is not something I have to make time to do, it is what makes me who I am. Thank you Jane, this is really useful. I can see that so much of PKM is having a set of habits that help us sort through what might otherwise be overwhelming amounts of information. Apart from filtering and sorting the good information that comes in via your network, I’m wondering if you could talk a little bit about how you archive and manage your information and links for your own use, so you can easily access it in the future. Do you have a core archiving/management approach and any particular tools you recommend to assist in this part of the living process? Andrew, I agree this post was quite minimal, I will endeavour to do another one with more detail. I should say that the archiving part is part of the “share” for me. I record links in my Reading Lists http://c4lpt.co.uk/library/janes-2012-reading-list-2/ or other places on my website, eg Tools list. I have done this for many years now – well before social bookmarking sites appeared – so I don’t really need them. All of my stuff is of course searchable so I can find things whenever I need them – but the important thing is that I have shared it as well, so others can use it too. Harold Jarche uses his blog in the same way, and refers to it as his “outboard brain”. That is a good description! Lovely – thank you Jane. You’ve made a good point about the sharing piece working as an active archive. I’m finding this particularly easy/useful with Twitter and to a certain extent with LinkedIn, but can see that I need to explore other bookmarking tools to be more effective/efficient.